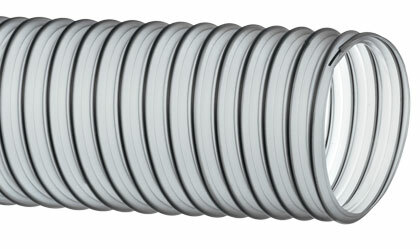 Vinylduct™ hose is constructed with clear food grade PVC and a steel wire helix with a service temperature range of -20°F (-29°C) to 180°F (82°C). The helix wire can also be grounded for static dissipation. The hose’s FDA, USDA, phthalate free transparent construction, allows for visual confirmation of material flow. Vinylduct™ Clear is designed for applications such as dust control, food grade material handling, lawn and leaf collection and light duty material handling. Hose is manufactured to meet the UL94VO flame retardant rating. Click here for more info.